A research team in Arizona has found that common zinc ore may have a key role as a catalysta chemical magic wandin the complex chain that must have led to the start of life on Earth. Their new paper in the Proceedings of the National Academy of Science (PNAS) shows that the widespread mineral sphalerite acts as an unexpected catalyst with organic matter, adding a new power tool to the workshop that gave rise to life. How did the mineral world bootstrap itself into the first forms of life? This is the question propelling a burgeoning area of research. Ordinary chemistry is little help. Creationists always argue that you can't turn a bunch of dead chemicals into living things by random chance. That's correct as far as it goes. The key is to start with a high-energy hydrothermal setting, where everything is more chemically active. Most of the basic ingredients of lifeorganic compounds based on carbonare formed and transformed in very hot places. A few kilometers below the Earth's surface, as well as at "black smoker" vents on the seafloor, temperatures are well above the boiling point and the necessary chemical reactions of organic compounds are possible. Oil and natural gas, for instance, are organic remains of once-living things that have been transformed in the hot depths. Lab experiments at hydrothermal conditions generally reproduce the right chemical reactions, but the reactions happen way too slow. The trick that life has mastered is to rely on enzymeschemical shortcuts using catalysts. Enzymes are proteins that include catalytic metal atoms in strategic places. Something in the exact configuration of the metal in the enzyme molecule fits a target molecule as a key fits a lock, and a reaction can happen rapidly that otherwise would take forever. Enzymes are well and good, but they're complicated molecules that raise the same objection as life itself. Life had to arise with the help of catalysts that are simpler than locks and keys. So origins-of-life researchers have been seeing what various ordinary minerals can do in hot water full of organic material. This is where the new PNAS paper fits in. A research team at Arizona State University, led by graduate student Jessie Shipp, exposed a mixture of the organic compound dimethylcyclohexane and water to high temperature and pressure. Dimethylcyclohexane exists in two different configurations, called cis and trans, and each can switch to the other given enough chemical energy. 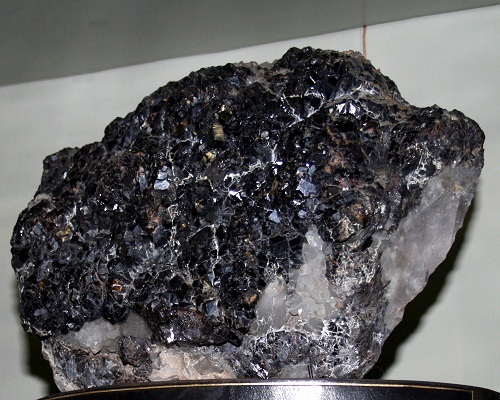 In past experiments, this conversion happened at a ridiculously slow rate, but when Shipp ran the experiment with a bit of powdered zinc sulfideknown to geologists as the mineral sphaleritethe reaction went to completion within a few days. It was easy to tell because the water was actually heavy water made with deuterium or double-weight hydrogen. Her team could confirm that the dimethylcyclohexane took deuterium from the water, which means that the sphalerite surface was helping to break the strong chemical bond between oxygen and hydrogen. Consider this analogy. Ordinary chemical reactions proceed like a swimmer in a pool, who can only move so fast in open water. But the swimmer can use the wall at the end of the pool to push off with extra speed and energy. The wall represents the catalystit doesn't do anything, but its configuration makes possible what would otherwise be impossible. 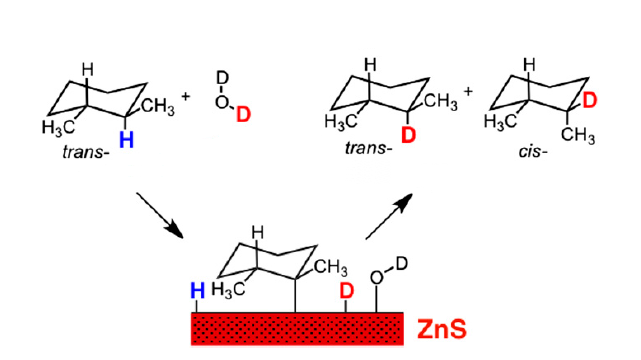 Here's a diagram from Shipp's paper showing the mechanism. Breaking water apart is a big deal. Shipp's study is a strong proof-of-concept exercise that supports the mineral scenario for the origin of life. Several other minerals, like mica and various clays, have also been shown to favor reactions essential for life. Shipp's work establishes sphalerite as a high-powered tool in the natural workshop. It also suggests, in her words, that "studies of the hydrothermal chemistry of such organic structures in the absence of minerals may be completely irrelevant to actual geochemical systems." Those sound like fighting words to me. Origin-of-life research is like the space program in that the knowledge we gain is both precious in itself, as food for philosophers, and useful in ways that no one predicts. As we seek the answer, findings along the way promise to advance the ways we do other things. Shipp points, in particular, to green chemistry, or ways to carry out industrial processes without expensive ingredients or poisonous conditions. One beauty of her findings is that the reaction promoted by sphalerite is very clean, with few contaminants and byproducts. If we could harness cheap, robust minerals like common sphalerite for these purposes, then refineries could become more benign and sustainable places.